Not only did super promoter Eddie Hearn throw down publicly with Showtime Sports’ honcho Stephen Espinoza on Tuesday, the two boxing powerhouses offered a rare glimpse into the inner workings of the sport at its highest level. The Twitter fight was centered around Anthony Joshua – the heavyweight powerhouse who, at the moment, possesses multiple titles in boxing’s glamor division – and a potential bout against he and American knockout artist (and WBC heavyweight titlist) Deontay Wilder. The megafight was in discussions last year before eventually falling flat. Wider went on to fight a memorable, controversial battle with former heavyweight kingpin Tyson Fury, while Joshua prepares to make his US debut against Jarrell “Bib Baby” Miller this spring. While the heart of the Hearn-Espinoza argument dealt with a fight that never was made, the details of the online battle focused on international broadcast rights. “Contract was sent and Matchroom saw it,” Espinoza tweeted. 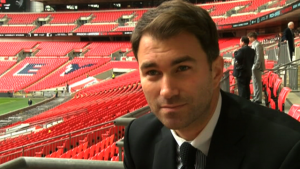 “Contract said Sky (a British outlet) got the UK rights.” Hearn responded by essentially calling Espinoza a liar. Espinoza then suggested that Hearn lied when discussing broadcast rights for the 2017 bout between Joshua and former heavyweight champ Wladimir Klitschko (which Showtime was able to air in the US). “Three detailed pages,” Espinoza replied, “not one paragraph.” Hearn continued to hold onto his position. “I repeat,” he tweeted, “despite requests we NEVER received a 1 page, 3 page or 50 page contract. If I’m lying then show the contract you sent.” Espinoza then reiterated that he “never said ‘we’ sent a contract. I said a contract was sent.” Hearn insisted that team Joshua “NEVER received a contract from you, Wilder or ANYONE despite requests.” Espinoza went on to tweet “I’m not going to expose private business arrangements in a Twitter discussion.” The argument went on, however, with each side accusing the other of being less than forthright.